Delonghi DEM10 Compact Review - Is It Still Great Value? The DeLonghi DEM10 is now well over 7 years old and it has occupied high positions at the sales charts, often at #1, throughout that period. There are tens of thousands of these machines working diligently away in homes across the UK. DeLonghi has since introduced the more advanced, but expensive DES16e, but due to its higher price, many have been sticking with the tried-and-trusted DEM10. In this review we’ll see whether this machine’s best days are behind it, or if there is still life in the old dog yet. 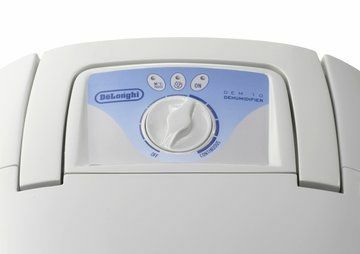 The DeLonghi DEM10 was born in an era when dehumidifiers were dehumidifiers, not the digital, air-purifying, all singing, all dancing machines now available (at a higher cost, mind you). Against this benchmark it therefore doesn’t score well on features. The control panel is basic, with the only moveable part being a rotary dial, which operates as the ‘on’ switch when moved away from its most anti-clockwise position. In its most clockwise position the machine switches into ‘continuous’ mode, where it will keep dehumidifying no matter what the relative humidity of the room. 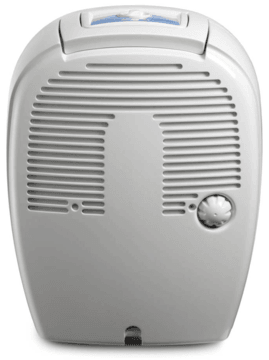 This is similar to the ‘laundry’ or ‘turbo’ modes that you may see on other dehumidifiers as driving the humidity as low as possible causes greater evaporation from the clothes or damp room. Between the two extreme of positions lay your range of humidity options. 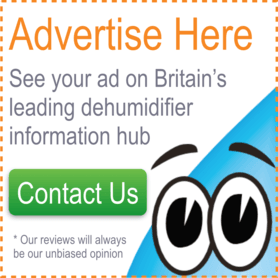 Once the DEM10 reaches the particular humidity that’s been set then it will stop dehumidifying, running the fans only until the humidistat senses that the humidity has increased and it kicks back in the dehumidifying components. The problem here is that the model gives no indication of the humidity you have selected. As an estimate I’d say very roughly that 8 o’clock on the dial is 80% relative humidity, 12 o’clock on the dial is 60% relative humidity and just before the continuous setting is 40% relative humidity. The ideal range is 40% to 60%, with closer to 40% being better when it drops below 5°C outside. A humidity meter (available very cheaply) may help you out here. The second issue with the DEM10 is that it only has one fan speed. 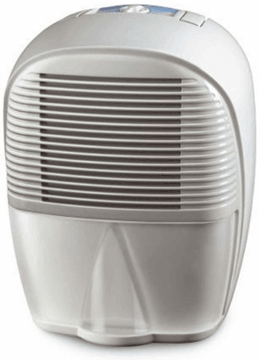 Most dehumidifiers now have at least two fan speeds, which means that you have the option of power when you need it and quietness when you don’t. So DeLonghi with the DEM10 have plonked one fan speed in between these two extremes. There are three lights across the top of the control panel. One illuminates when the machine goes into ‘defrost mode’. Because the DEM10 is a refrigerant dehumidifier, the refrigerant coils can periodically get covered in frost and become inefficient, so the machine kicks into defrost mode to prevent this. This will happen more and more as the room temperature drops, with the unit not being particularly effective below 15°C, where a desiccant dehumidifier (see our menu above) could be a better choice. One of the other menu lights turns on when the water collection bucket is full and yes, the DEM10 does stop dehumidifying automatically when the bucket is full, so there isn’t a risk of overflows. The final light simply illuminates when the unit is switched on. The water collection bucket is totally clear and with it being on the front of the machine only requires a quick glance to view the current water level. The bucket doesn’t have a handle or a lid, so be careful when walking over to the nearest sink with it, although the bucket is narrow, which makes slopping less likely. The bucket has a 2-litre capacity, which is standard for this size and power of machine. There’s an auto-drain ability if there’s a sink nearby, with the valve for the pipe being on the back of the machine. The only sort of air purification with the DEM10 is a washable dust filter to keep the refrigeration parts clean. There’s no antibacterial filter or ioniser (unsurprisingly!). Refrigerant dehumidifiers are not known for their portability and the DEM10 is no exception. It weights 10kg out of the box, which isn’t too bad for a refrigerant model, however it isn’t as powerful as heavier models, so is to be expected. Dimensions of 33cm deep by 35cm wide by 42cm high make this unit shorter, but much deeper than rivals. There is a top-mounted carry handle to lug the unit around, should you need to. The design of the DEM10 is simple if nothing else. I don’t think many people will be needing to get the instruction booklet out to operate it. Looks-wise I think it’s OK, the plastic quality is good and the panels are broken up by various details, but you decide. Having just one fan speed really lets the DEM10 down in this area, as it has got to be strong enough to dehumidify a whole house and yet it can’t be too strong that it becomes overly noisy. This means that during day-to-day operation the DEM10 is definitely nosier than some rivals. It’s also a different kind of sound to some of the models released recently, with the hum of the compressor being more noticeable than the noise of the fans. Due to the noise, I would think that you’d need to keep the model outside of your bedroom or lounge. I’d recommend a downstairs hallway as your best bet. The DEM10 extracts up to a maximum of 10 litres per day, but bear in mind that this was measured at a balmy 32°C and 80% humidity, the perfect conditions for extraction by a refrigerant dehumidifier. Under UK conditions expect much more modest returns of around two litres per day once the unit is ‘bedded in’. The DEM10 will do a solid job of maintaining a more pleasant and less damaging climate in the ‘ideal’ 40%RH to 60%RH range in homes up to a maximum of three to four bedrooms. The beauty of this machine is that it is virtually bomb-proof and will just keep running and running for years. 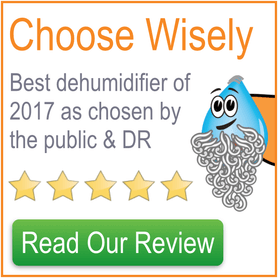 The DEM10 is one of the cheaper options available and a good choice for someone that doesn’t want to pay for any of the gizmos that many other dehumidifiers come with these days and isn’t bothered too much by the little extra noise. There’s virtually always a sale on at this shop, so it’s worth checking that out before you make up your mind. Thanks for the link, think I’m going to go with the DEM10. I think if you’re tight for cash, the the DEM 10 is the obvious choice. Nice review. I’m tempted by the Delonghi DEM10, but I wish they’d put a digital display on it.